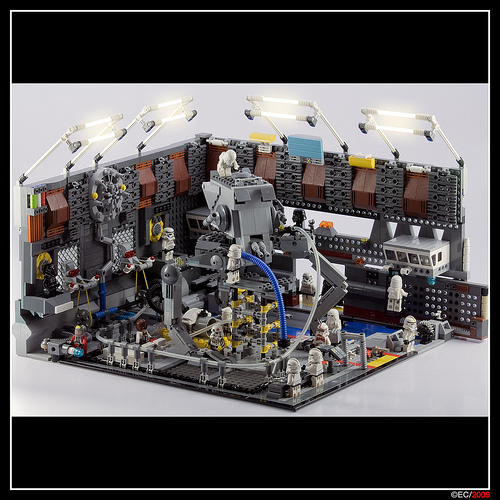 Ernesto Carillo has posted his completed diorama of an Imperial factory that produces AT-STs (or “chicken walkers”). The scene is full of technical detail, and the lighting effect added to the photo is excellent. I note with approval the complete lack of safety rails. Love the title of this post! :) Nice diorama. Very awesome factory. The one thing though is that there are no specialized AT-ST builders though. There is a combination of snowtroopers, clone troopers, TIE pilots, ARC commandos, clone commanders, and clone engineers, not to mention the rebel pilot and Ten Numb.